Even though spring has clearly arrived, there are still many folks anticipating the coming of winter. After years of anticipation, the finale of Game of Thrones is almost here, bringing an end to an amazing decade plus run. If it sounds eerily familiar to the reporting on the decade-long bull market run up – it just might be. In this edition of the roundup, we take a look at the pullback in deals and promotions heading into April that may leave brokerages scrambling to ride the tech IPO wave set to wash over markets later this year. Also in the spotlight this roundup is the latest move by one online brokerage to shuffle the deck on their premium account offering – perhaps creating an unintended race for lucrative clients in the months ahead. As always, we’ve tapped into the investor forums and Twitter to see what online investors were curious about this past week. Let’s face it, by now most Canadians have had their fill of winter. One of the downsides of the end of the winter stretch for DIY investors, however, is that discount brokerage deals activity tends to melt away much faster than the snow on a Vancouver sidewalk. With the RSP contribution deadline in the rear-view mirror, the start of April saw a pullback in the number of offers and the number of online brokerages actively trying to recruit new clients or assets through the use of promotions. The news at the beginning of the month wasn’t all negative, however. There were two important extensions from online brokerages popular with highly price sensitive online investors: CIBC Investor’s Edge and Questrade. In terms of CIBC Investor’s Edge, their cash back offer has been extended through to the beginning of May. This positions their offer against only a small number of other active cash back offerings currently in the market. For CIBC Investor’s Edge, a less crowded deals space offers a double win: first, this means more spotlight on their brand and second, more spotlight on an offer that is particularly compelling to DIY investors – the cash back bonus. For Questrade, their unique transfer fee coverage promotion has been extended through to the end of June. This means that they are actively challenging other brands and competitors by offering to pay for transfer fees imposed by those brokers on clients who wish to leave. It is worth restating that for investors with smaller-asset portfolios (under $15,000 – $25,000) who are looking for a different provider, this is the best exit plan currently available. In most years the last big possible spike in investors seeking out new investment opportunities, including investment accounts, would be the income tax refund window, which would typically wrap up in May. That said, 2019 is a unique year for unicorn tech stories going to IPO. Names like Uber, Airbnb, Slack, and more are still scheduled to come to market, which means investors will be keen to access these investment opportunities and, as a result, will be kicking the tires on which online brokerage will be best for these IPOs. For that reason, even though there have been a few April showers when it comes to discount brokerage deals, it seems like this year there will likely be a few savvy brokerages bringing some flowers (or promotions) to win over DIY investors ahead of the big rush to step into the IPO wave. 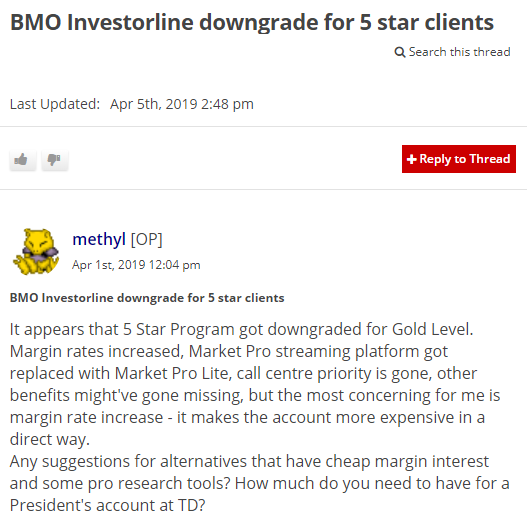 Earlier this month, BMO InvestorLine rolled out some important changes to their “5 star” program, a premium set of services that are offered to higher value clients. 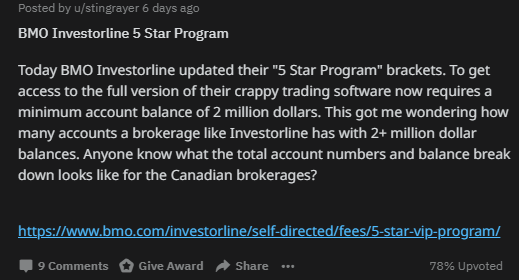 Prior to these changes, the 5 star program consisted of three tiers – Silver, Gold, and Platinum – which offered qualifying clients discounts on trading commissions (when first launched), preferred interest rates, reduced fees on non-trading transactions as well as real-time quotes, level 2 quotes, service perks and access to their top tier trading platform. Importantly, the threshold to qualify for the 5 star program started at $250,000 for the Silver tier. Clients with assets of $500,000 or more qualified for the Gold tier, and assets of $10M or more qualified for Platinum status. Under the new structure, the 5 star program features three tiers – Gold, Platinum, and Diamond to replace the Silver, Gold, and Platinum. Qualifying for the first tier in the new structure requires $250,000 or more, which suggests that the previous Silver and Gold tiers have now been amalgamated into the Gold tier. The threshold for Platinum Star is $2M in assets or higher and Diamond Star is $5M or higher. What has certainly gotten forum users chatting is the fact that under the new system, certain benefits are no longer available to Gold tier clients, such as access to BMO’s premium platform, Market Pro, which was replaced by a “lite” version. Also no longer available to Gold tier clients is streaming level 2 trading data, which, for active traders, will be a big adjustment. Despite the turbulence encountered on the forums, it is an interesting move by BMO InvestorLine to redraw the lines on the premium account experience – especially lowering the threshold for Platinum and creating a new tier, Diamond. On the one hand, it makes more premium experiences available for valuable clients more accessible, but on the other, it clearly creates a sore point for some other of their clients. Other bank-owned brokerages have comparable programs in place for higher value clients so it will be interesting to see how they respond in kind. The table stakes are highest with this segment of client, and most premium programs have a minimum threshold that starts at $250,000 which creates an interesting opportunity for competing firms in some areas, and potential hurdles in others. Specifically, if the forum posts offer any indication of what clients are thinking, the segment between $250,000 and $2M might be more volatile than in previous years. Quite possibly, competitors may take this signal to draw more attention to their typically hushed premium programs – especially if they’re prepared to offer streaming level 2 quotes. A DIY investor on RedFlagDeals wants to know how to readjust their portfolio to weather a possible looming recession. See what advice other forum users provided here. One new online investor has questions about wading into investing and the differences between robo advisors. Check out this Reddit thread for other forum users’ opinions. Talk about mixed signals. Even though ominous signals for markets loom in the distance, there’s all kinds of economic data and exciting stories to make 2019 another volatile adventure. While everyone is trying to figure out the market’s endgame, there are other endgames close at hand. Between the Avengers and Game of Thrones, there’s going to be no shortage of reasons to avoid April showers to get in some serious screen time.